I went on about how much I loved the Lili Lite for those that like to do a little reading before bed. Well this new lamp would be great for those that prefer their reading corner. That or it might be that you don’t want to give up your nightstand to have something like the Lili Lite. Either way, this on and end table or nightstand would make for a nice area to relax and enjoy a good book. It has a spot that sticks out to hold the place in your book, which is a better option than bending one of the pages. However, if you’re a nut for not sticking to the same book all the time, you’ll still have to pick up some bookmarks. Really the cute design is just a regular lamp with an extra piece attached to it. 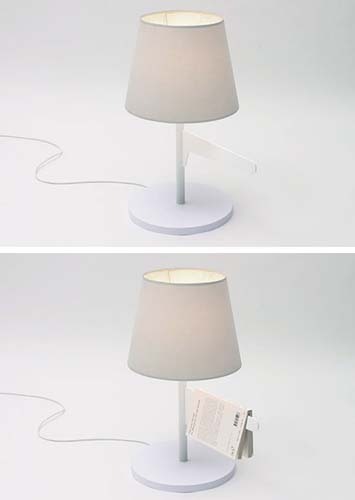 Sadly, the Bookmark Bedside Lamp is only a design. Which means that we’ll have to stick with the far less interesting option of using a bookmark, at least for now.